Samford University’s Department of Nurse Anesthesia has received the maximum 10 years of continuing accreditation from the Council on Accreditation of Nurse Anesthesia Educational Programs (COA). Notification of the accreditation decision follows an extensive self-study and site visit conducted in fall 2014. In the accreditation notification letter to Samford, COA Executive Director Francis Gerbasi praised the program for this accomplishment. “The COA would like the program to know that very few programs are granted accreditation with no progress report required. Even fewer programs have achieved the maximum accreditation of ten years,” he wrote. “Therefore, the directors of the COA are particularly pleased to offer their congratulations to everyone at the program who has demonstrated their commitment to meeting the requirements for continued accreditation,” he added. According to Terri Cahoon, chair of Samford’s Department of Nurse Anesthesia, the successful accreditation decision is the result of the tireless work of the department’s faculty, staff, clinical partners, alumni and students. “We have so much to be grateful for - supportive administration and staff, caring faculty, and incredible students and alumni. We are indebted to clinical coordinators, preceptors, and alumni who came to campus to meet the reviewers and allowed them to observe in the OR, especially Children’s of Alabama, Princeton Baptist Medical Center, Brookwood Medical Center and St. Vincent’s Health System. We have had amazing teamwork,” said Cahoon. “Through our self-study, we realize that our program is one of quality that does things the right way. Former and current faculty have established best practices to continuously improve the education of our students,” she added. 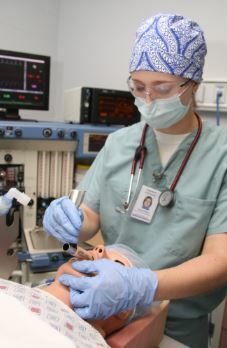 Numerous strengths of the program were highlighted in the COA report, including clinical faculty’s exceptional level of commitment to the program and its students; the program’s affiliation with a wide variety of clinical sites affording students the opportunity to experience the full scope of anesthesia practice; and the service learning program that offers students a unique opportunity to interact with culturally diverse populations on local, state, national and international levels. Samford’s nurse anesthesia program is a 28-month, 82-credit course of study that awards a Master of Science in Nursing degree and prepares graduates to sit for the national certification examination. Graduates from the program experience exceptional success, Cahoon noted. The five-year average pass rate for first-time test takers of the national certification exam is 95.5%, while the 2014 national average was 86.4%. In 2014, 100% of the graduating class were employed within six months of graduation. COA accredits nurse anesthesia programs in the United States, its territories and protectorates. The mission of the organization is to grant public recognition to nurse anesthesia programs and institutions that award post master’s certificates, master’s and doctoral degrees that meet nationally established standards of academic quality and to assist programs in improving educational quality. Samford’s nurse anesthesia program first received accreditation in 2003 when it was established in the Ida V. Moffett School of Nursing. Since that time more than 236 individuals have graduated from the program and are practicing as Certified Registered Nurse Anesthetists (CRNAs) in 24 states and around the world. The next accreditation review for Samford’s Department of Nurse Anesthesia will be in May 2025.